Aerosmith bassist Tom Hamilton joined Pearl Jam to perform his band’s 1977 classic, “Draw The Line”, during the second of two nights at Boston’s Fenway Park on August 7. 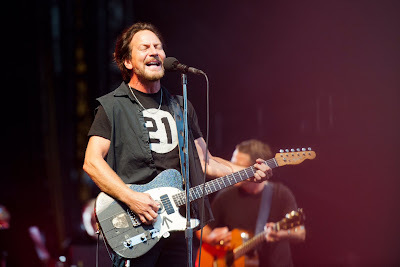 “We played this song two nights ago not having any idea that it might be played again,” frontman Eddie Vedder told the crowd, “or the next time we played it, it would be different. Hamilton has been touring with Thin Lizzy this summer and had just returned to the States from a gig in Sweden when he hit the stage. Pearl Jam’s 34-song set ran more than 3 hours, with material from their full catalog mixing with covers of tracks by The Ramones, The Who and Neil Young. The Seattle rockers will wrap up their 2016 tour with two nights at Wrigley Field in Chicago, IL on August 20 and 22. 24 hours ago I was on stage with Thin Lizzy. Tonight I got to play Draw the Line with Pearl Jam. How many bands can I join in a weekend?